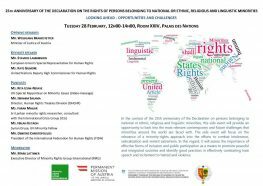 In the context of the 25th anniversary of the UN Declaration on Persons belonging to National or Ethnic, Religious and Linguistic Minorities, this side event will provide an opportunity to look into the most relevant contemporary and future challenges that minorities around the world are faced with. The side event will focus on the relevance of a minority-rights approach into the efforts to combat intolerance, radicalization and violent extremism. In this regard, it will assess the importance of effective forms of inclusion and public participation as a means to promote peaceful and integrated societies and identify good practices in effectively combatting hate speech and incitement to hatred and violence.